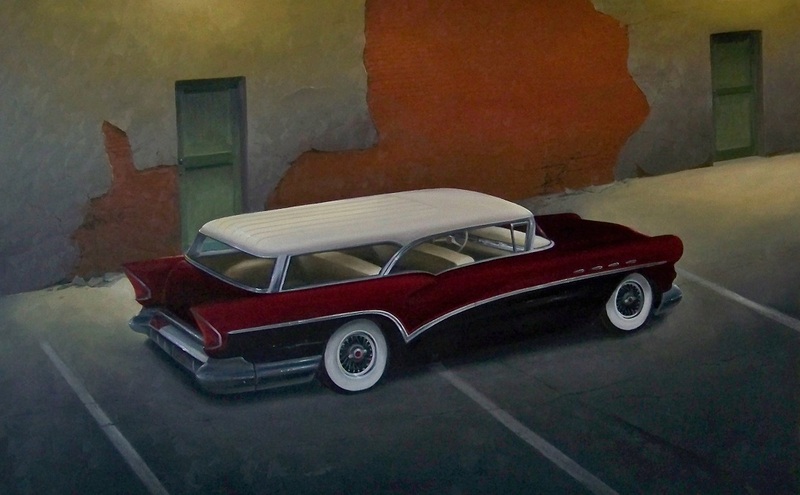 Self-taught artist and car enthusiast Rick La Komy’s work reminds me of Edward Hopper in its minimalistic quality. 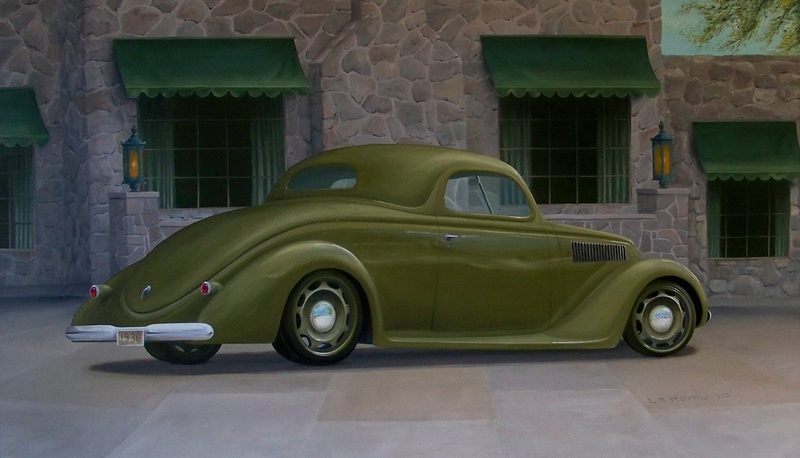 His auto paintings are shown here for the very first time. 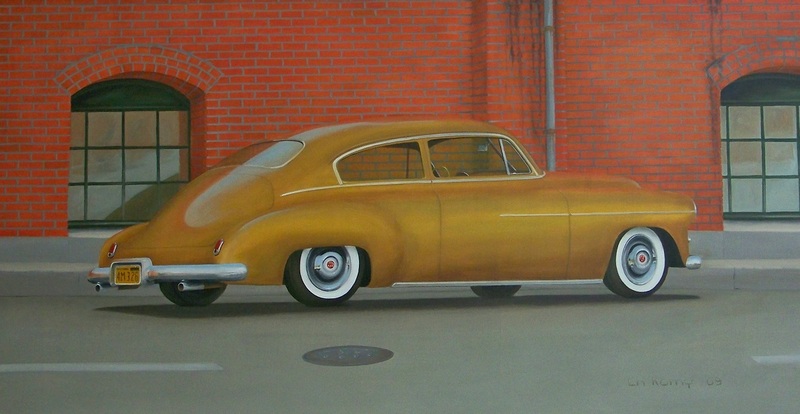 Rick: I’ve drawn and painted various subject since I was real young. After a long hiatus of a working career (Not in the art field), with only an occasional picture I have been able to get back to my interest the past five or six years. 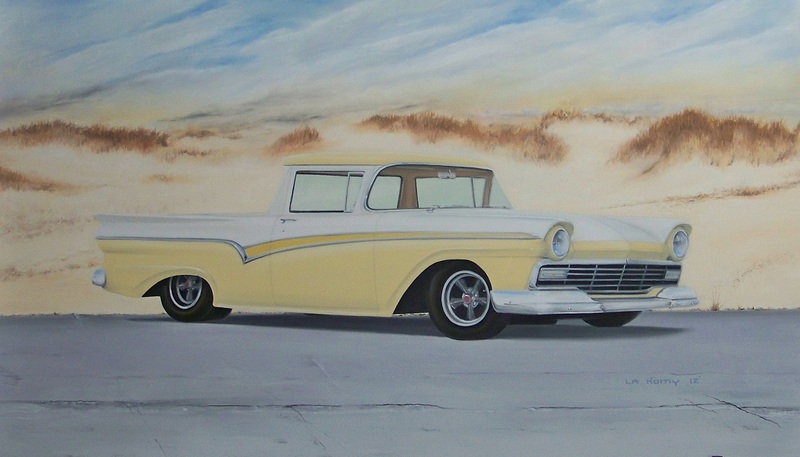 Other than taking art classes in high school I have no art training and seeing as how painting with oils is my preference and I enjoy different subjects I thought I might combine my interest for cars with an interesting background and these are the results. Everything is done freehand like those long side strips for examples and some parts of these pictures takes a good-looking at changing before I’m satisfied with it. I can’t say that I’ve ever sold any pictures or that I’ve even tried. So for now with inspiration from artists like Tom Fritz, stepping into my studio… turn on some Bob Dylan, and start drawing and painting is working OK. 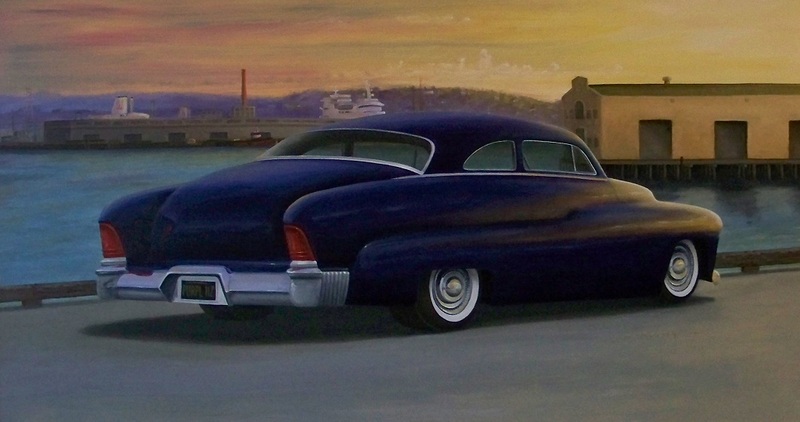 Growing up in the 50s and 60s everything was about cars. 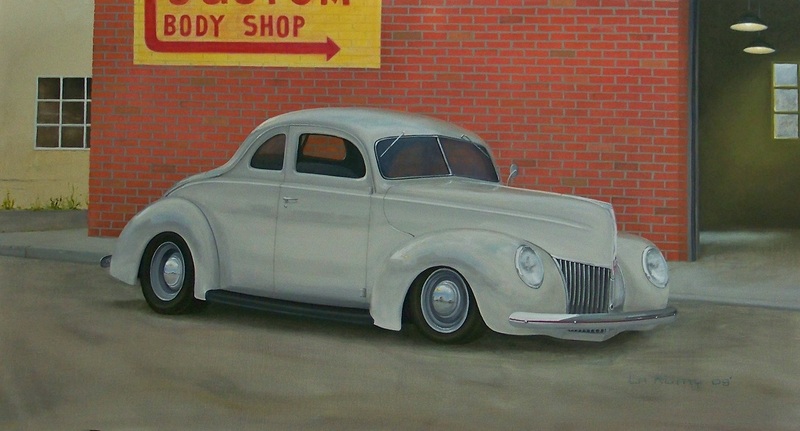 Drawing my own ideas for custom cars, building model cars, looking through the little magazines, going to local car shows like the Oakland Roadster show, having a father that owned a body shop and an older brother that did his own custom work, I pretty much was a car nut. I can’t leave out cruising East 14th on Friday night and some greasy fries and a coke at Chuckles. 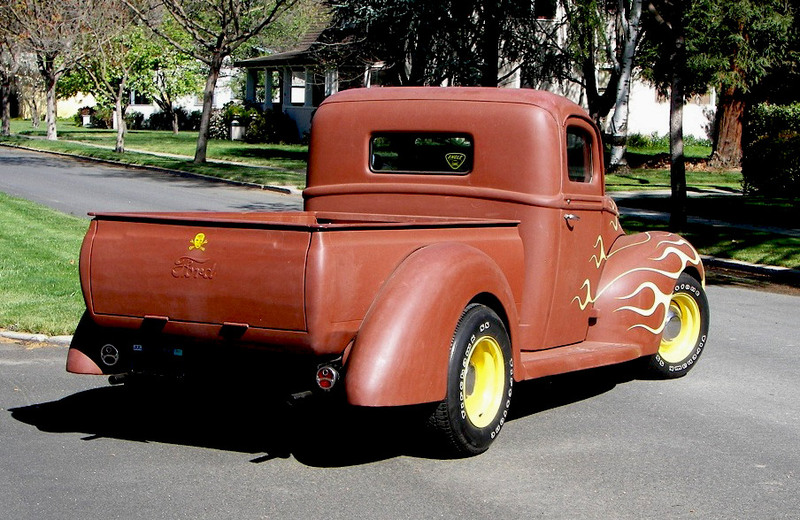 And yes, I have a hot rod of my own (1940 Ford Pickup) which I have chopped the top, flamed, sectioned the hood, and updated the bed to match the body style. 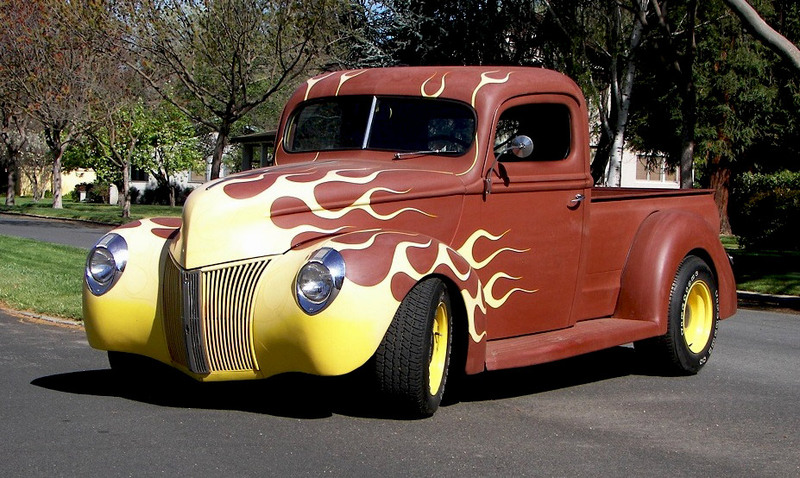 Black tuck-n-rolled interior, big tires in the back and a six-volt flathead keep it rolling. It was a real basket case when I first bought it 25 or so years ago. Except when I first brought it home it had some real farm truck patina. 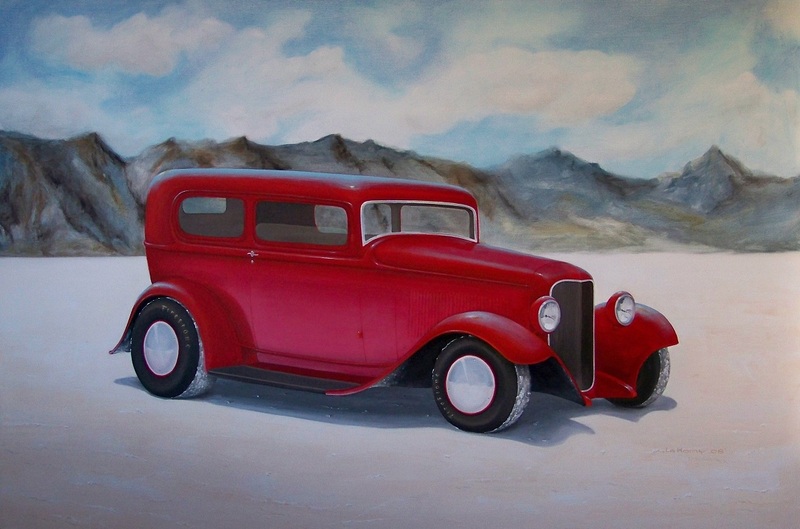 Since then it’s been red oxide and I really have no plans of giving it a paint job that I have to worry about. 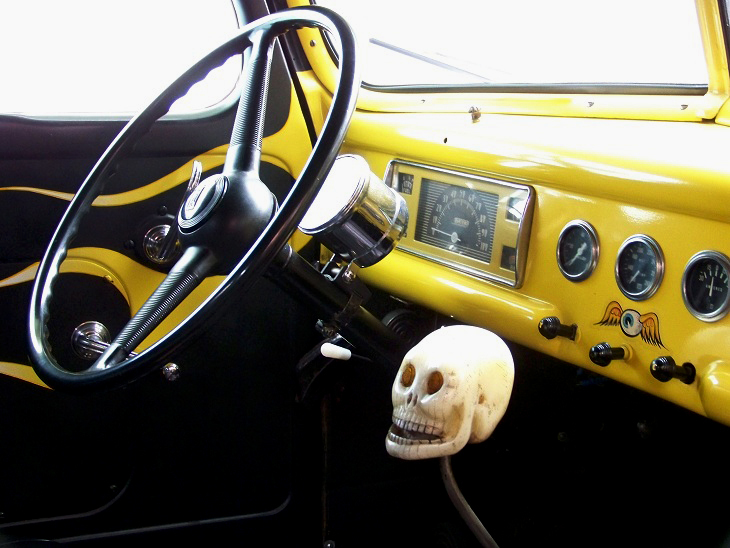 Oh, that gear shift nob I crafted myself many years ago and the flames on the inside door panels I put on so I could see my flame job while driving around. 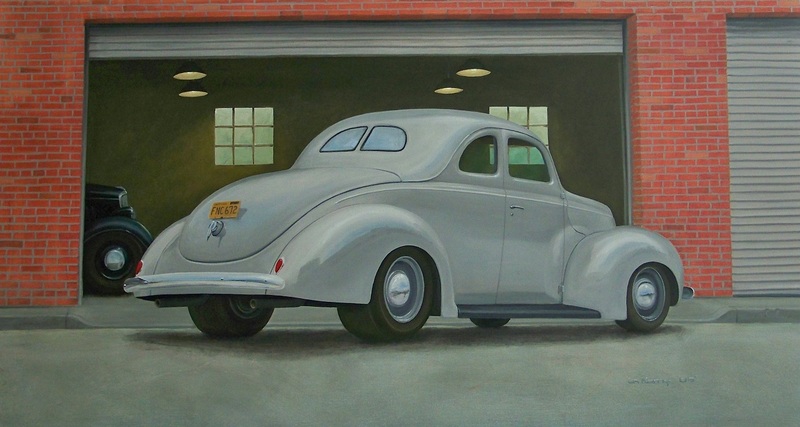 I have known Rick since our Freshman year in high school in 1959 and we were in the same art class, he did fantastic work than and amazing art now!